AMC engines have a crank torque converter bore diameter of ~1­-13/16”. GM engines and correspondingly the torque converters are smaller diameter. 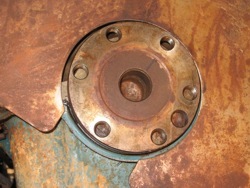 In order to use the GM torque converter with the TH400 on AMC engines a thin spacer ring was employed to properly locate the converter in these applications from the factory. This is a reproduction of that part. Machined from high quality steel this will replace the original part exactly which is no longer available. Originally used with the AMC TH400. In theory would allow any GM converter with standard diameter to index on the crank, though spacers to the block bellhousing pattern generally position them too far to the rear to be effective. As required, we have complete transmissions or adapters available. A proper driver is recommended for installation. However, Jeep owners are known for their ingenuity, we’re sure you’ll sort it out. If not, we keep these on the shelf if it takes a 2nd try.